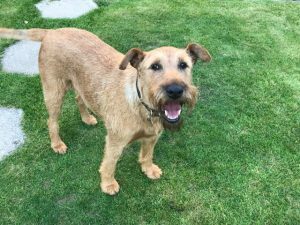 Irish Terriers love to live in close contact with their families and absorb a great deal of household behaviour without being taught directly. Rather in the way that some working breeds have an instinct for herding or retrieving, Irish Terriers seem instinctively to fit in with their families and know exactly what each member is about. They have a great facility for understanding words and will recognise their own and everyone else’s names very quickly. Most owners confess to resorting to spelling words or even speaking French if they don’t want the dogs to understand. Irish Terriers, however, are not naturally obedient; they are not programmed to take instructions. After all, you need to be a free thinker to catch a rat or a rabbit, not wait to be told what to do. They get bored easily, but they love to please you and, with lots of praise and time, will learn almost anything. Individuals vary considerably in their aptitude, but no terrier should be expected to behave instantly like a guard or police dog. Irish Terriers often come up with tricks of their own. One of ours always selected a toy from her box when friends came. She would walk stiffly up and down, head held high, parading it for all to see and making a soft, growling sound. It was not for giving up, but only to show and, after much clapping and praise, she would walk out on tip-toes, deposit it somewhere and rush back. wagging her tail and delighted with herself.